This 170 page book was self-published by Dr. Ken Johnson in February of 2012. 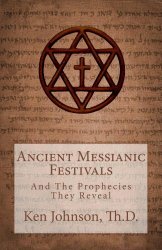 In it, Dr. Johnson details the principles of the 7 Jewish Festivals and the history of their observance. This isn’t “his” perspective on these sacred convocations, but rather the insight that he uncovered while researching each through ancient Jewish writings. Dr. Johnson also provides extensive information on the Sabbath, Hanukkah, the Wedding Ceremony, the importance of the New Moon, and the Red Heifer. In each of these cases, Dr. Johnson deals with the topic from the perspective of the original institution of the festival and the symbolism that it was designed to portray. In our interview, he described them as “dress rehearsals” that foreshadow a prophetic event that was yet-to-come. In some cases, the prophetic picture was finalized and fulfilled with the initial coming of the Messiah, but the final 3 festivals point to the Messiah’s return and are yet to be fulfilled. The detail that is given is quite eye-opening, as so much can be reviewed as historic events that we can carefully examine. As we do so, we see that every detail was pointing towards prophecy and each aspect was fulfilled with startling accuracy. This book is an extremely interesting read for those who are looking for deeper meaning in their Bible study and a strengthening of their faith. If you listen to the interview we did with Dr. Johnson about the festivals, I’m sure you’ll look forward to getting this book and spending some time learning more.